The P28 point source system features a V-arrangement with two 8” neodymium transducers and a high precision 1.4” HF compression driver mounted onto a waveguide with 90° x 40° dispersion. Both 8” transducers feature an extremely stiff UPM (Ultra Precision Membrane) carbon membrane design, which raises the particial oscillation to an inaccessible frequency range and reduces distortion to a minimum. The superior membrane damping is increased to a maximum, while natural oscillation is lowered to a smallest value. The UPM design further enables for increased speaker power capability of 1000 W (RMS). 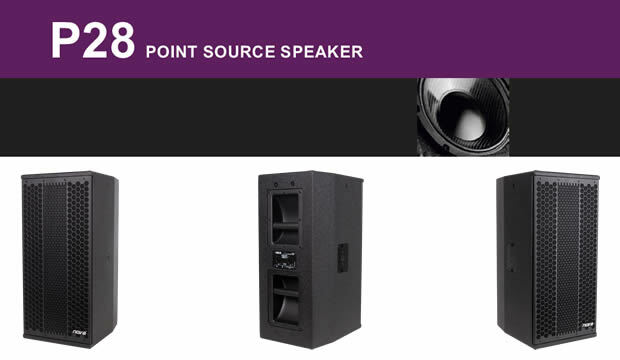 The P28 loudspeaker cabinet includes a passive 2-way crossover, which ensures for high efficiency in system cabling and amplifier configurations.The V-arrangement of the two 8” transducers ensures a very precise mid-range coverage of 90° also at the typically critical frequency range between 700 Hz and 1.100 Hz. The vertical coverage is 40°. The acoustical and mechanical design enables arrays of up to three P28 modules among themselves. The cabinet is constructed from plywood and is covered with weather and impact protecting Polyurea coating. The front of the loudspeaker is protected by a robust metal front grill with acoustically transparent foam. The backside includes 2 handles. The self lock U-bracket rigging system ensures easy angle adjustment. Ideal to use as FOH system, delay, frontfill or in high grade installations. Compatible to all M-Series and P-Series Subwoofers.